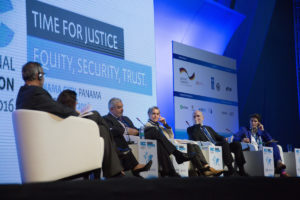 Journalists and human rights defenders need greater protection if they are going to be kept safe and free to continue the fight against corruption, experts have told an audience at the 17th International Anti-Corruption Conference in Panama City. The murders of prominent activists like Honduran Berta Caceres and the threats many journalists around the world face as they do their job show that there remains much to do, panelists from the UN and other organisations told the “Time for Security” plenary at the IACC. Both sectors face intimidation from governments and organized crime gangs, and are also being silenced by tough “security crackdowns” which are more about protecting power than keeping the public safe, they said. She said she was particularly concerned by regimes using security and criminal defamation laws to crack down on the press, and highlighted how in Turkey 140 journalists are now in prison for insulting the president or due to broad anti-terror laws. Worldwide, she said more than 100 journalists have been killed every year since 2009, many of them because they were working on local corruption stories. She said personal intimidation has also had a chilling effect on the media with threats forcing journalists to abandon sensitive subjects, or leave the profession altogether. Magdy Martinez-Soliman, the assistant Secretary-General of the UN and the UNDP assistant administrator, said that “there has always been a tension between liberty and civil society” but that history showed that fear can be “manipulated by governments that feel threatened”, giving them the legroom to impose tougher security measures on their citizens. “We need to reject vehemently this idea that you have to choose between security and liberty. Since when? I want a government that does both. That’s the first thing – rejecting this false dichotomy, the false narrative that is offered,” he told the audience.